The beaches in Bali presents itself as a magnet, attract the attention of every visitor both locally and internationally. The beach and all of its beauty has become the pride of the tourism sector, particularly in this paradise island. This situation reflected by dense and crowded visitors at several beach locations in Bali. The good news is that there are always other beaches that certainly could be an option, with a calmer and relaxed atmosphere like Purnama Beach Bali. The beach offers a relaxed atmosphere, away from the bustle, and is supported by green rice paddies and peaceful rural environment. Purnama beach is known to have an amazing sea view. A black sandy beach with beautiful sparkling when exposed to sunrise, a row of palm trees, mountain views, and rice paddies of Bali. This beauty is also accompanied by the deep blue sea of Bali Strait along with Nusa Penida as its backdrop. Really worth a visit when you are on holiday in Bali. Purnama beach is situated in Banjar Lumpang Telabah, Sukawati Village, District of Sukawati, Gianyar Regency, Bali. 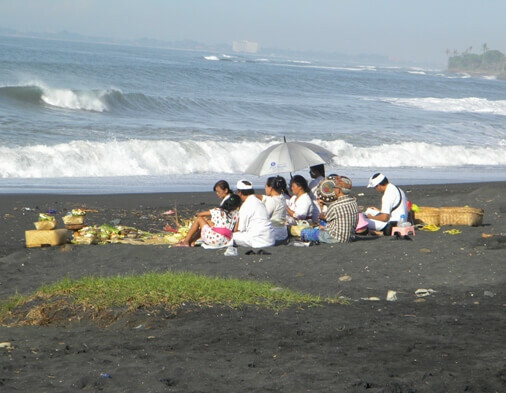 The beach is accessible via the main road of Prof. Dr. Ida Bagus Mantra, and then continues along a smaller street. The paddy fields will accompany along the trip. Visitors can also see one of the most important temples in Bali, Pura Erjeruk Sukawati. This temple keeps the track record of the Nirartha Dang Hyang journey, a holy priest from East Java. 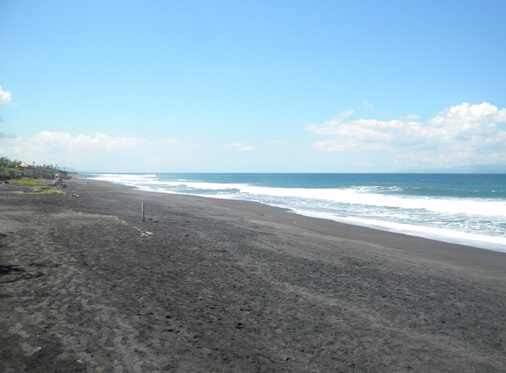 The waves sounded faint until you end up at the site and see the beauty of this black sandy beach. You will be greeted by a pile of reef-rocks, resembling a small pyramids-shape with ornate of white-yellow cloth, traditional Balinese umbrella, and also some statues. This feature is used to put the offerings when Hindus pray. 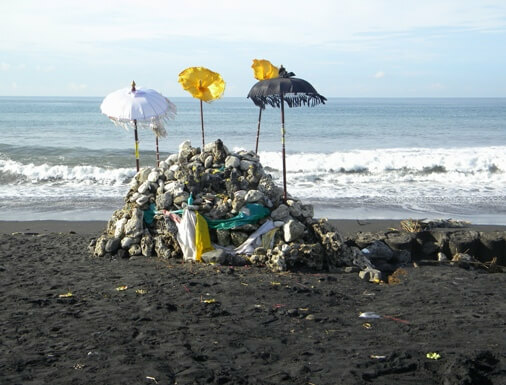 This beach is the place for Melasti and Ngaben ceremony. In addition, at any given moment visitors can see the Balinese Hindu conduct a purification ceremony or "melukat" here. 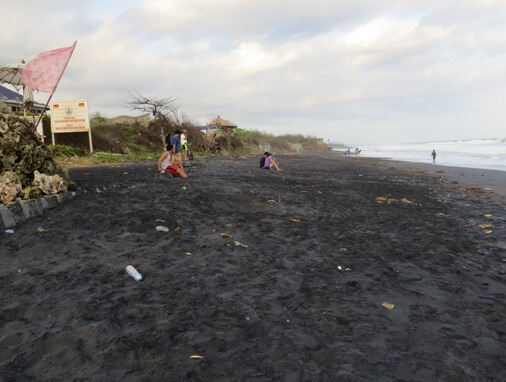 Purnama Beach has been suffered a severe abrasion along the coastline in Gianyar Regency, including the Lebih Beach. It is based on a survey conducted by Bali's Environmental Agency (BLH). Abrasion has contributed to the loss of private lands, destroying the settlements, shrines and infrastructure. 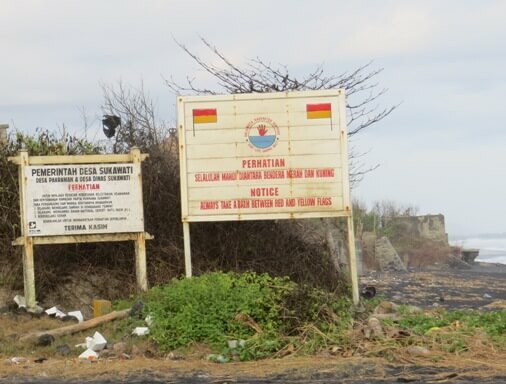 However, the beach in Gianyar holds the potential of coastal fish resources, particularly in the Badung Strait, which can be managed to improve the economy of the population. At any given time, many visitors come here for fishing. They threw the rod from shore and wait for the fish take the bait. While the fishermen using traditional boats for fishing in the sea. The tranquility and beauty of the atmosphere at Purnama Beach will attract and impress every visitor. Moreover, the beauty of rural oceanfront setting with lush vegetation, the glittering black crystal sand, waves, and the Bali Mountain has attracted lovers of photography to hone skills and creative with their ideas. Purnama beach is also a strategic location to access several surfing point in Bali with world class waves such as Keramas, Ketewel, Sanur Reef and more. 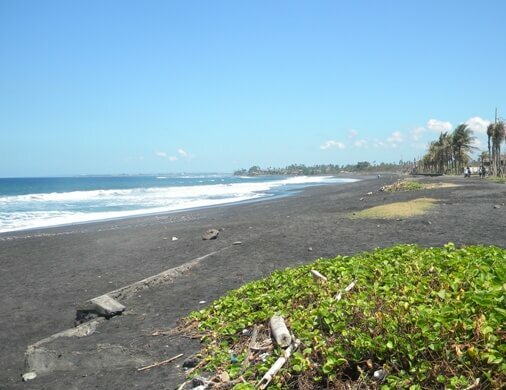 The coastal region in Gianyar as Bali surfing point is known to have great and powerful waves. Wet season is the best time to surf here. Several other activities such as recreation, sunbathing, relaxing, and walking along the beach can be done here. Due to the reef-rocks beach and strong waves, visitors are advised not to swim. To support the tourism in Purnama Beach, there are several villas and accommodation services for visitors who plan to stay. The cleanliness along the beach is keep maintained. There are also other facilities such as the "warung" or food stall and extensive parking.